UPDATE | The man hit by a car in a hit-and-run incident at the intersection of Ocean Boulevard and Magnolia on Monday has suffered a broken leg, according to police and hospital sources. Multiple sources also confirmed the man was an employee at the Hotel Maya and was leaving work on his bicycle when he was hit. The broken femur on his left leg was possibly the result of the car running him over, after carrying him on the hood of the car for a distance, before he rolled off. Another police source said the suspect told them he had previously hit a car and was fleeing the premises when he hit the cyclist. The victim was transported to St. Mary Medical Center, according to the police source. 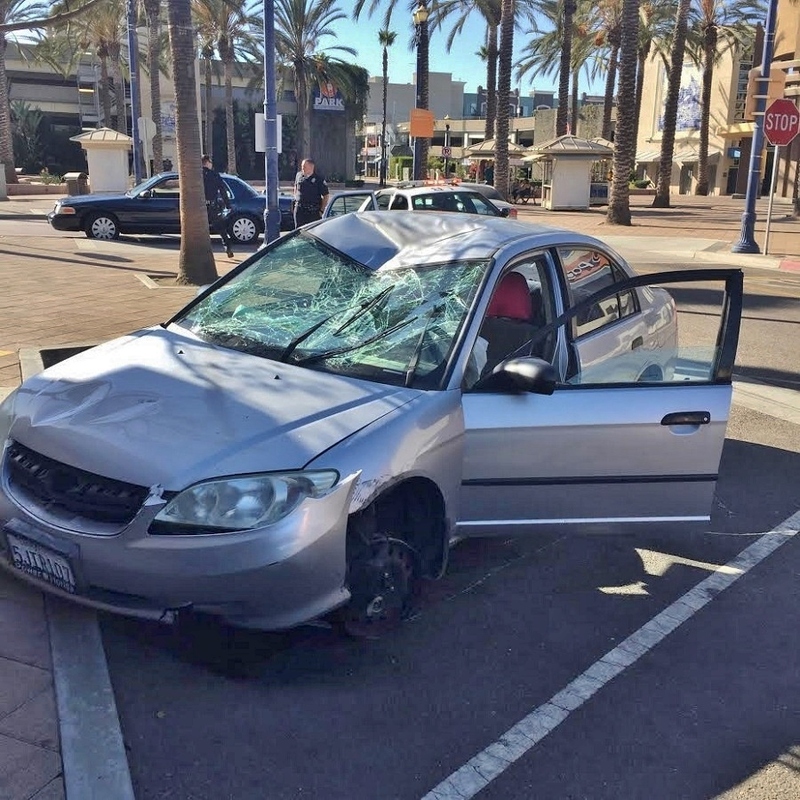 On 10/3/2016 at 6:30PM | Both the suspect and the victim of a hit-and-run crash were transported to local hospitals Monday afternoon after the motorist struck the bicyclist in downtown Long Beach, authorities said. The incident occurred on Ocean Boulevard, just east of Magnolia Avenue at 3:15PM, according to Long Beach Police Department (LBPD) spokeswoman Marlene Arrona. Witnesses said the bicyclist began crossing the street on the east side of Magnolia Avenue, from the south side of Ocean Boulevard to the north side, when the motorist ran a red light and struck him. A female witness, who was walking behind the bicyclist, said she was able to step back and avoid the car but the bicyclist was not able to move out of the way in time. After the victim fell off the hood of the car, the suspect ran over the victim’s foot and kept driving east on Ocean Boulevard, the witness said. The motorist, who witnesses said was driving erratically, continued traveling down Ocean Boulevard, when another witness, Roman Ansari—who was driving on the opposite side—noticed the suspect and began following him. He trailed him as he ran red lights and even went down the wrong way on a one-way street, nearly hitting multiple pedestrians. Ansari, who has a police scanner, said he chased the suspect down all the way to the Promenade and 5th Street, where the suspect parked his vehicle in front of a business and walked casually toward a parking structure next to the former Walmart location. Ansari said he followed the suspect to the parking structure and was able to direct arriving officers to him. “When the cops came, I told them ‘he’s underneath the car,’ and when they drew their guns he came out peacefully,” Ansari said. The suspect was arrested and later transported to a local hospital due to injuries related to the deployment of an airbag. The bicyclist was also transported to a local hospital. His condition is unknown at this time. 10/3/16 at 3:49PM | A cyclist hit by a passing car minutes ago at Magnolia and Ocean Boulevard in Long Beach is currently conscious and being attended to by Long Beach Fire Department (LBFD) personnel. The man who hit the cyclist with his vehicle has been apprehended by police, according to authorities. Witnesses said the motorist who hit the cyclist ran a red light was driving a silver Honda Civic. The car reportedly sustained damage to its front end, as a result of the incident. The Long Beach Police Department (LBPD) officer on site said the suspect has been apprehended in a parking structure near the Promenade in downtown Long Beach. Post reporter Stephanie Rivera captured an image of the suspect under arrest in front of the space formerly occupied by Fresh & Easy, as well as the suspect’s vehicle. Over 320 vehicle vs. bicycle and/or pedestrian collisions have occurred in Long Beach this year, according to LBPD statistics released to the Post. At least 5,700 such incidents have occurred over the past decade.